Toot Baldon is a village and in the civil parish about 5 miles (8 km) southeast of Oxford in Oxfordshire. Since 2012 it has been part of the Baldons joint parish council area, sharing a parish council with the adjacent civil parish of Marsh Baldon. The 2011 Census recorded its population as 148. "Toot" is derived from an Old English word for "a look-out place". "Baldon" is derived from the Old English for "Bealda's Hill". The Church of England parish church of Saint Lawrence was built mostly in the 13th century. It was restored to designs by the Gothic Revival architect Henry Woodyer in 1865. The church is a Grade II* listed building. There is a monument to the 1965 Little Baldon air crash in the north aisle of the church. Court House Farm is partly 16th century. Toot Baldon manor house was built in the 17th century and is Grade II* listed. A parish school was built in the 19th or early 20th century. It has since closed and the building is now a private house. Toot Baldon has a pub. It used to be the Crown but is now called the Mole Inn. Toot Baldon and Marsh Baldon share a cricket club. 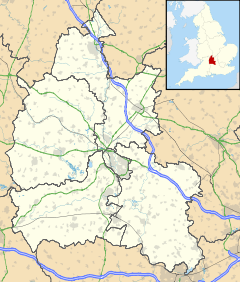 ^ "Area: Toot Baldon (Parish): Key Figures for 2011 Census: Key Statistics". Neighbourhood Statistics. Office for National Statistics. Retrieved 27 May 2015. ^ Alexander 1912, p. 209. ^ Alexander 1912, p. 46. ^ Sherwood & Pevsner 1974, p. 818. ^ a b c Sherwood & Pevsner 1974, p. 819. ^ Historic England. "Church of St Lawrence (Grade II*) (1193957)". National Heritage List for England. Retrieved 27 May 2015. ^ Historic England. "Court House (Grade II) (1047997)". National Heritage List for England. Retrieved 27 May 2015. ^ Historic England. "The Manor House (Grade II*) (1047998)". National Heritage List for England. Retrieved 27 May 2015. ^ Historic England. "The Crown Public House (Grade II) (1285927)". National Heritage List for England. Retrieved 27 May 2015. Alexander, Henry (1912). The Place-Names of Oxfordshire, their origin and development. Oxford: Clarendon Press. pp. 46, 209. Lobel, Mary D, ed. (1957). A History of the County of Oxford. Victoria County History. 5: Bullingdon Hundred. London: Oxford University Press for the Institute of Historical Research. pp. 47–56. Sherwood, Jennifer; Pevsner, Nikolaus (1974). Oxfordshire. The Buildings of England. Harmondsworth: Penguin Books. pp. 818–819. ISBN 0-14-071045-0. Wikimedia Commons has media related to Toot Baldon. This page was last edited on 8 November 2018, at 12:45 (UTC).